Officer Meadows opened the passenger door of my truck and asked me if I was okay. He thought I had been driving slowly and touched the white line several times. Had I been drinking? It was one of those roads paved in sections, patched many times. With my wheelbase and suspension, I was bounced all over the road. I tried driving closer to the center line, closer to the edge, slower, faster—trying to find the sweet spot in that road that wasn’t going to bounce my back all around. We chatted a bit about where I was going and why did I live in Texas when I had a farm in Wisconsin. I told him I was taking a box of bees to the farm—and he said his uncle had thirty hives and they frequently harvested honey without protective gear. I was relieved—he knew not to swat at the bees—the fastest way to make them mad and sting—and maybe a mass exodus from the box. Like life, though, there was no sweet spot—just drive straight on through. Maybe a stop or two for some pleasant conversation with a nice young man. Claiming ownership of one’s work–signing a letter, a painting by more than just a style..is it important? In the past I had settled for a plain jane type label,..a bit of muslin ironed to freezer paper, words traced from a print-out using a nice font, edges turned under and then the label sewn to the back in the lower right corner. Sometimes I pieced the label into the back–when people were announcing a lot of quilt thievery. After surveying my rising stack of completed pieces, and thinking through what I really enjoy –I like the making–not the having–I began making fancier labels. Although this label is for a quilt I did not make–I did contribute to its making–I used part of the fabrics in the front design, printed the words out using a hand-writing font–my hand-writing is not so neat–traced the words onto the muslin and then finished all the edges. 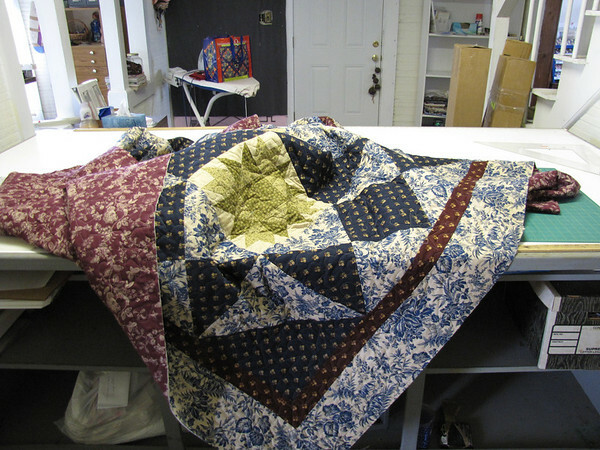 This quilt is a donation quilt for our local guild–and will be on display at our local quilt show in April. And I keep all those print-outs in a special binder–if only I added sizes to the print-out I would have a ready reference to each year’s endeavors. I was re-organizing my sewing space—I do not call it a studio–that sounds too fancy–and would imply I only produce notable artwork in there–instead of doll dresses and grand-daughter dresses and grandson shirts and quilts for community service plus the rare mending of something. A quilt pattern complete with plastic templates caught my eye–it was something I had bought at the last Quilt Festival in Houston and never opened—so I opened that envelope and discovered really tiny templates and a challenge to make a star a day for a year! Even though no-one saw me open that package, I thought how hard could it be to make a star? And maybe I should just test those templates. The completed stars will finish at 3 inches–so those pieces are teeny-weeny. I now have a considerable stack of them with more to follow. Will I do it for a year? Maybe, maybe not. I spend a lot of time driving. It is a time of contemplation for me–a landscape that looks barren but is filled with life–birds-bugs-beasties including those legless creatures. While many would think this is boring and would need entertainment I am content in my thoughts. This photo was taken somewhere north of Hondo Texas. The week between Christmas and New Year’s has always seemed to be a time to reflect upon the past year/s and to plan for the upcoming year. Somehow the first two months of the year always slide by and I manage to get around to planning and setting up goals in March–which may be appropriate as it is my birth month. Then, there is the ritual of setting aside the past year’s day-planner and installing the new year’s planner. I’ve tried a lot of methods over the years to plan but what seems to work best for me is a set of index cards with broad categories. I review them occasionally–not as often as perhaps I should–but then I have learned that I need to slow down and rest more. The past year was less exciting than previous ones with my medical deductible being met only two weeks before the end of the year instead of two weeks into the year. A small thing perhaps, but exciting for me as my social life seems to revolve around doctor visits to my assortment of specialists. I hope this year will see fewer medical issues and more fun and travel. 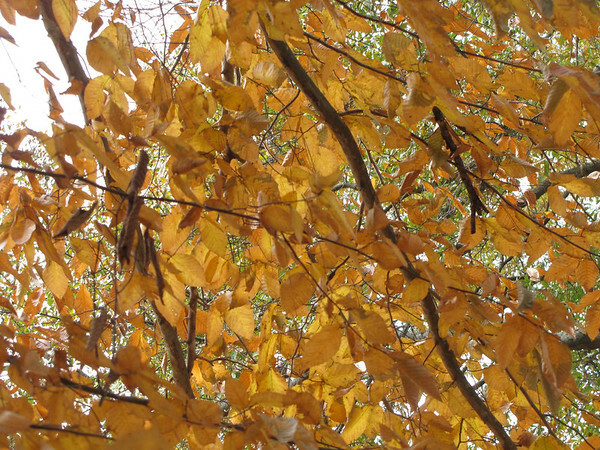 As always I want to finish up projects–but then I have new ones that seem to spring up and push the old ones back. I guess if I really wanted the older ones, I would have done them by now–but they can stay neatly–or not so neatly–written on an index card that I peruse while waiting for a Netflix to load. Today, more Netflix and ordering of garden seeds. 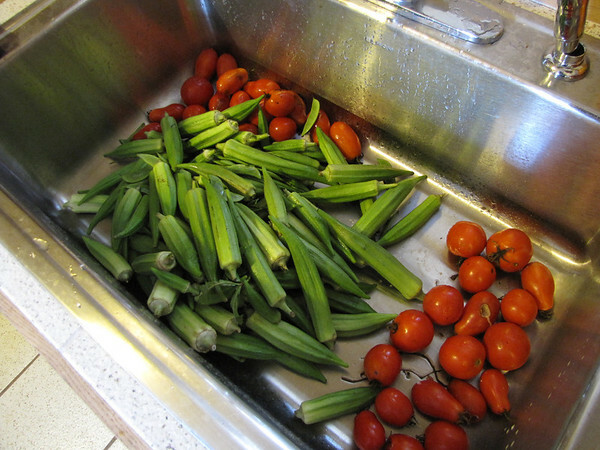 This year I hope to have a garden as productive as it was two years ago with a sink filled with produce to process—-this was just one day’s picking. This is obviously not a photo of hair! A couple of days ago I got a very nice letter from Pantene thanking me for the donation of my hair to their cancer wig program. I first donated my hair sometime in 2002 or so as a memorial to my mother who died of ovarian cancer. But this time the donation was for me. In 2010 I became very ill with systemic histoplasmosis, an endemic fungal disease exacerbated by a medication I was taking for Rheumatoid Arthritis. After surviving hypoxia and 8 days or so in ICU plus 5 weeks in a stepdown unit, my hair was brittle and lifeless—-and bedraggled. My husband took a scissors and cut it some shorter to make it easier to manage as I needed help in most daily activities. Whenever I combed my hair, the comb would be quite full. I looked much like the Velveteen Rabbit. So I took myself off to the hairdresser and Traci cut it, laughing as she could she where Glen had cut it. It looked nice, but continued to fall out and I returned and asked her to cut it very short. She said she could see new hair growing. The dermatologist had told me that my hair would fall out for the length of time that I had been ill. It was a great blow to my ego. Then as it grew back, it was incredibly curly—and white! I had a Wisconsin style hairstyle without the smell of a perm. I hated looking at myself in the mirror and only did so on rare occasions accidentally while brushing my teeth. Traci patiently trimmed and shaped my hair as the months went by and gradually it became about 15 or 16 inches long. I decided to conquer my vanity but having it cut really short again and donating the hair to someone who (like me) had lost their hair due to health issues. I’ve had a lot of compliments on it, it is no harder to care for than my long hair and my husband says I look at least ten years younger. It is hard to admit to vanity, and even harder to conquer it. The feelings of yet another something totally unfair and casually passed off by health care personnel who looked at my age and thought–why should she worry about this? and then my physician thought the initial hair loss and cut was just a style change that women all did periodically. This was hard and unlike some of the other things that happened later, this was visible to the world, a symbol of my un-wellness. Choosing to have short hair is far different than having short hair. There hasn’t been a lot of activity here or on my design wall. After working hard on the last two pieces both of which were rejected, it is hard to build up enthusiasm for starting something new. I’ve been considering why that is so. Is it a feeling of failure with work rejected from two shows? And then not wanting to risk rejection again with another work? Or is it a need to complete something useful? That all the artwork is frivolity and it would be a better use of my time to produce useful items. Or at least reduce the quantity of ‘stuff’ that I have for heirs to deal with. I’m not planning on that need for some time but things happen when least expected sometimes and being prepared makes for less confusion. Having been executor of my parents’ wills, it was not an easy task and made more difficult by the lack of instructions. Perhaps I am procrastinating because there are so many options and I’m not sure which to choose? And is one better than another? Or is it avoidance thinking that success will mean more expectations? The more I do, the more people seem to want–whether it is a work shift or volunteer work or family expectations? Or maybe it’s because I spend an inordinate amount of time trying to deal with a computer, a cell phone, and all their intricacies all couched in a language I do not understand? a world of No. 2 pencils and a spiral notebook—or a blank sketchbook and a ball point pen are tools I understand. So why am I still sitting here in my nightgown, writing away here instead of dealing with the piles of projects some half started, some just an idea, and a few nearly completed except for an hour or so of work? Or maybe it is because I need to winnow down the possibilities. In true avoidance this morning, I read through a few of my old journals. It was popular for several years to choose a word to describe the focus of the year. One year I chose ‘Refine’ and the following year “Conquer”. Weaving has always fascinated me-===from the time I was about eight and was allowed to sit at my great-grandmother’s floor loom and weave rag strips into rag rugs. My grandmother at some point wanted her dining room back and so asked my mother if she wanted the loom–Mom said no—I cried–and Dad told me later that she regretted that decision. Looms can be broken down into bundles of sticks that don’t take up much room–but our little house was packed with six children and all their assorted belongings. I had looked for used looms in various places, finally discovered a rigid heddle loom on ebay–promptly bought it and a book–but was totally confused as to how the warp it—and without a warp there can be no weaving. Several years passed and I discovered a yarn shop in Old Spring that taught heddle weaving—I was the first on the list to sign up and learned on one of their looms. I knew the basics of weaving from a college class in weaving but the warping is different—this uses a warping peg. Now I had to order some equipment–warping pegs, sley hooks, a ball winder and a swift–all needed to change hanks of yarn into balls of yarn for use. 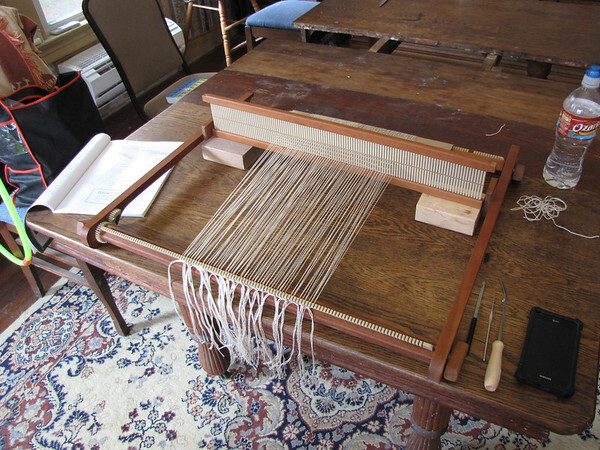 It has all been sitting on a chair in the dining room–and today I decided to give warping a try. 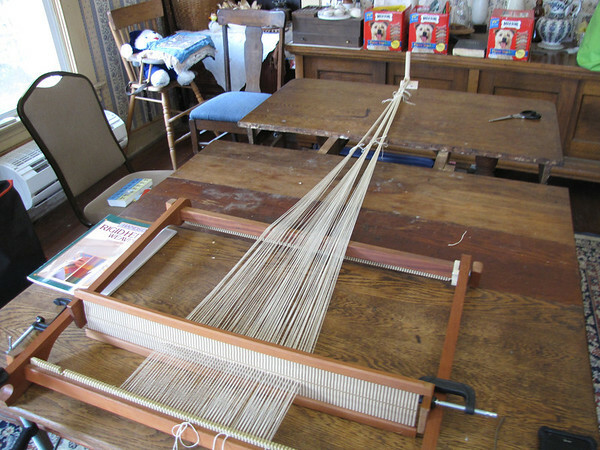 This is a Beka Loom—and after some fiddling with clamps to fasten it to the table–I don’t think I have that quite right yet, I now have my first warp on the loom. It is very back intensive work–and so the fun part of weaving will have to wait–but I’m pleased. I worked on my dining room table and could have had a longer warp but i could not pull the table apart any more–it has six more leaves to go in it–but this was as much as I could make it stretch. And yes that is three boxes of dog treats in the background–one for balls and frisbees, one for treats and meds and the third one for biscuits. 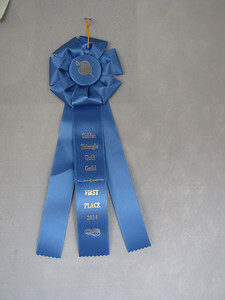 Last week my local quilt guild had a judged show with over 300 quilts on display. It’s been a long time since I entered a ‘regular’ quilt but I was certainly surprised to get a blue ribbon on a kit quilt. So my sewing skills are adequate–a lot to do with the use of my quarter inch foot with side runner—and then I had it professionally quilted as it was so huge–108 inches square–I just did not think I could wrestle with it in my mid arm. So I will have to rethink what I might care to enter in the future. Of course there is no money involved—just bragging rights. and here is part of the quilt I showed earlier this year. here it is as the squaring up stage before sewing on a half mile of binding. This is at my shop-play house out on Highway 90.